The death of the eminent Lebanese Shia religious authority, Grand Ayatollah Mohammed Hussein Fadlallah, resonated almost as much in the West as it did in the Arab and Islamic worlds - but for entirely different reasons. For many in the West, Sayyid Fadlallah's name was irrevocably linked with acts of violence against the American presence in Lebanon in the early 1980s. 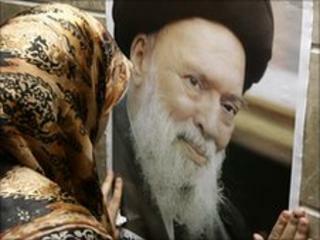 But in Lebanon and among Shia communities further afield, his passing was mourned as the loss of a spiritual giant whose teachings and writings placed him in the top rank of "sources of emulation", religious leaders whose edicts and prescriptions on spiritual and other matters are followed implicitly by the Shia faithful. In addition to more than 40 books and treatises, the ayatollah also leaves a rich legacy of charitable institutions and theological schools through which he will be long remembered. His undoubted influence across the Shia world was attested by tributes from Iraq, the Gulf and other communities where his influence was felt. But his broader stature became evident from glowing praise and condolences from such figures as Amr Mousa, head of the largely-Sunni Arab League, who lauded him as a patriot and conciliator, and from Lebanon's Sunni Prime Minister, Saad Hariri, who called him "a voice of moderation and an advocate of unity". Sayyid Fadlallah was the only eminence in Lebanon on a par with the Grand Ayatollahs in the two major centres of Shia learning, Iraq and Iran. Since someone of his stature cannot simply be replaced, Lebanon will thus lose its status as a place to which Shia turn in search of guidance, until such time as another eminence might emerge. In the West, Mohammed Hussein Fadlallah was widely seen as the "godfather" of Hezbollah, and his name became well known during the turbulent and dramatic events that followed Israel's invasion of Lebanon in 1982 and the subsequent ill-fated insertion of an American-led Multinational Force. Lebanon was turned into a proxy battleground for a wider regional and international struggle. Iran at the time was embroiled in an all-out war with neighbouring Iraq which it believed was launched by Iraq in 1980 on behalf of the US and its allies to stifle the 1979 Islamic revolution in its infancy. Iran's regional strategic ally Syria was deeply threatened by the Israeli invasion and US presence on its western doorstep. To drive the Israelis and Americans out, Tehran and Damascus cooperated to set up Hezbollah, drawn from the Lebanese Shia community and funded and trained by Iran and its Revolutionary Guards, working through Syria. Suicide attacks on the US embassy and Marine barracks in Beirut were instrumental in persuading the Americans to withdraw. With the Israelis it took much longer - only in 2000 did they complete a unilateral pullout, seen as a triumph for Hezbollah's "Islamic Resistance" and its Iranian and Syrian backers. Sayyid Fadlallah supported the Iranian revolution and was enthusiastic about the birth of Hezbollah, which he saw as a vehicle through which the oppressed could fight occupation. But his exact relationship with Hezbollah in its early years remains opaque. He was never part of its formal hierarchy. But they came from the same background and environment, and shared many of the same ideas and ideals. His outspoken denunciation of Israeli occupation and American policy certainly amounted to a spiritual blessing for Hezbollah's activities. At the time of the huge car bomb attempt on his life in 1985 - for which CIA-trained Lebanese agents were reported to be responsible, and in which 80 people were killed - it was said that Imad Mughnieh was among Sayyid Fadlallah's bodyguards. Mughnieh swiftly acquired notoriety for his reported involvement in numerous bombings, hijackings and kidnappings in the 1980s. When he was killed in a mysterious car bomb explosion in Damascus in 2008 - after years of public silence about his activities - he was hailed as Hezbollah's top military commander. But Sayyid Fadlallah always denied implication in any of Hezbollah or Mughnieh's alleged doings. He also specifically denied, certainly in later years, that he was Hezbollah's "spiritual leader". It certainly appeared that his relations with Hezbollah in the 1990s were ambivalent, if not troubled. As he became increasingly eminent in the clerical hierarchy, Sayyid Fadlallah established himself as an independent authority, a marja al-taqlid, the "source of emulation" to which the faithful turn for guidance on religious and other matters. While he backed the Iranian revolution, he did not support the Iranian invention of the concept of Wilayet al-Faqih, which gives unchallengeable authority in temporal matters to the Supreme Leader, currently Ayatollah Ali Khamenei, who was only a mid-ranking cleric when he attained the leadership. Hezbollah by contrast pays allegiance to the Iranian leader. When Israeli troops pulled out of Lebanon in 2000, the Hezbollah leader, Hassan Nasrallah, travelled to Tehran to congratulate Ayatollah Khamenei. Few Hezbollah rank and file members took Ayatollah Fadlallah as their marja. But he commanded huge respect among the Shia masses in Lebanon, and relations with Hezbollah remained warm. Al-Manar, the Hezbollah TV station, interrupted its programmes to announce his death, and dropped its normal output in favour of Koranic recitations and live pictures of condolences being received at Ayatollah Fadlallah's south Beirut mosque. Despite his unrelenting hostility to Israel and to American policy in the region, Ayatollah Fadlallah's views on social and other matters were more liberal than was to the taste of some hard-liners. He took a strong stand on many women's issues, and set up a number of women's centres. Some of the fatwas (religious edicts) he issued were against female circumcision and "honour" killings, and he ruled that women had the right to hit back if beaten by their husbands. He also opined that abortion could be permitted in cases where a woman's health was at risk.